 Brain injuries are classified into two basic categories; those that are associated with obvious, incontestable evidence of intracranial injury and those that are not. Obvious intracranial injuries include those with evidence of pathology within the brain itself (intraparenchymal injuries) as well as areas of bleeding around the brain but within the skull. 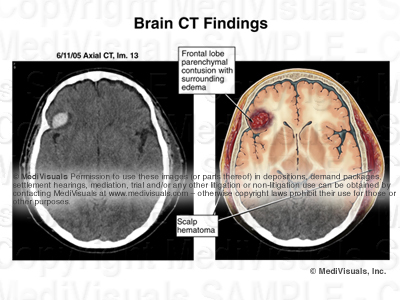 The light area in the scan below indicates blood within the brain tissue, and the surrounding dark area shows associated edema. Both of these are considered to be intraparenchymal injuries. 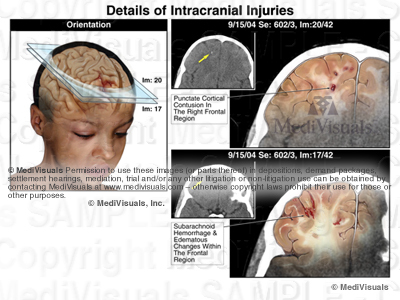 Contusions and hematomas found outside the skull are not considered intracranial but are frequently illustrated to help emphasize the force and direction of the trauma to the head. The areas of hemorrhage shown in the illustration below are scattered around the junction between the grey and white matter of the brain, which is consistent with injuries from shear forces. The grey and white matter are of different densities, and when the brain impacts the skull during a traumatic event, the subsequent unequal movement between the two causes damage at their junction. Head trauma can cause tearing of the blood vessels around the brain, which can result in areas of bleeding (hematomas). 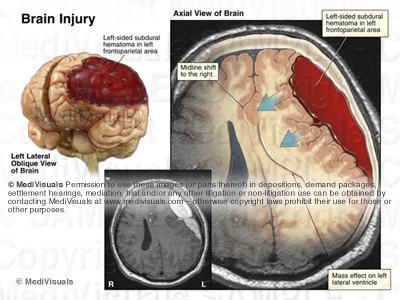 As the bleeding continues, the hematoma may expand to compress the brain tissue (as shown in the following illustration) and may require an emergency decompression. Significant compression must be relieved quickly in order to avoid further neurological damage and/or death. 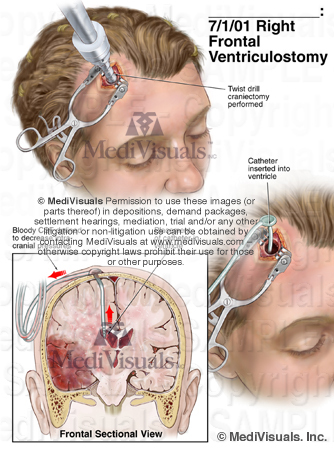 Introducing a ventriculostomy catheter is one approach used to alleviate increased intracranial pressure. A hole is drilled directly into the patient's skull, and a catheter is advanced through the brain tissue into one of the ventricles. The catheter allows some of the cerebrospinal fluid to escape, thereby relieving the pressure on the brain itself. In other situations, a craniotomy may be performed to allow the blood to be suctioned from the area surrounding the brain. A bone flap is created by first drilling three holes into the skull and then making cuts between them with a saw. This flap is removed and the blood is cleared from the areas above and beneath the dura. In some cases, the bone flap is not replaced if the brain is swollen or if there is a significant concern over recurrence of the hematoma. 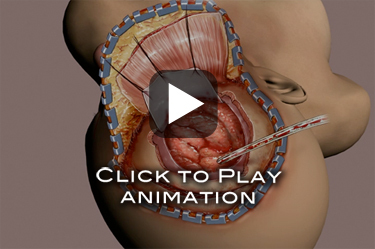 For a more detailed look at the craniotomy procedure, please review MediVisuals Craniotomy Surgery Animation.